Fog and mist are common here in autumn, and today the sunshine barely made it through for more than a few minutes, but luckily I was there with my camera when it did! I think the rose has convinced me it can stay. Do your plants talk to you? This entry was posted in Days, Garden, Nature, Tuesday View and tagged Autumn, Garden, Nature, Seasons, The Tuesday View, Tuesday View. Bookmark the permalink. I am so enthralled with my roses this fall…blooming away still. We are getting a bit more sun today. The roses go on and on this year. What a delight they are. My Rosa mutabilis looks as good as it did in June. Like flights of butterflies. I love your red maple looking all fiery. The maple is also going on and on this year. It started turning orange very early, but has still not reached its peak which is normally the second week of October. I swear plants know when you’re about to get rid of them! 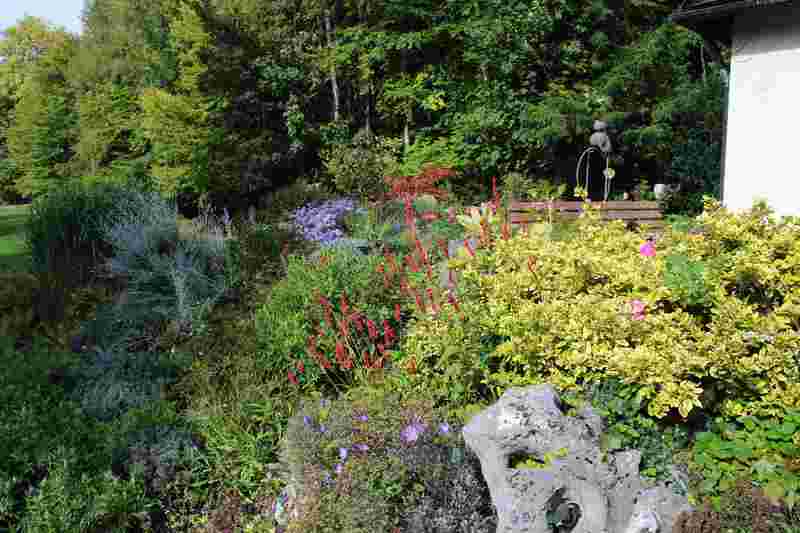 I was convinced I would not bother next year with that blue Salvia “Evolution”, and now it is smashingly gorgeous. The Japanese maple is gorgeous. How lucky you are to have it! Enjoy your fine weather. After a couple cool, cool days and nights that flirted with frost, we are supposed to have a string of nice weather here, too. It’s still so mild here Kimberley, despite the sun struggling to get through, I’m wondering if we are all going to be taken unawares by a cold snap this month. It often snows at the end of October, so I am making the most of this weather while it lasts! It has flowered so well this year, albeit intermittently! Oh definitely. My Iceberg rose pulled the same trick recently. Yours is beautiful–enjoy it. What else can you do? Your Japanese acer is earning its keep! 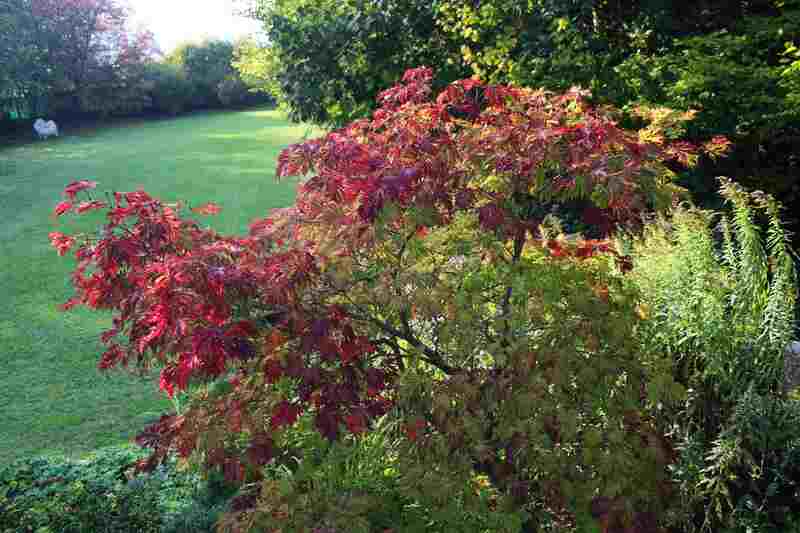 The acer really is wonderful – so glad we have it and that it is near enough the house to enjoy from indoors too. It’s nice to see a larger slice of your garden, Cathy. Loree at danger garden (Portland, Oregon, US) made a similar assertion about plant intuition earlier this week – she was contemplating getting rid of a Clematis and an Abutilon when both burst into glorious bloom. I can’t recall a similar even in my own garden – perhaps I need to do more plant whispering to get my point across. That rose certainly hauled it out in the last hour, LOL. It’s very pretty, and you’re so fortunate to still have roses blooming. What a wonderful treat! There are quite a few more buds coming too, so it should look good till the first frosts. I love seeing roses with frost and snow on them! Love the colours in your autumnal garden and that of the beautiful rose bud . . .on the other side of the world my huge apricot weeping rose is just about to burst into its first full spring bloom . . . still just mid-spring here but the temps have been up to 34 C 🙂 ! 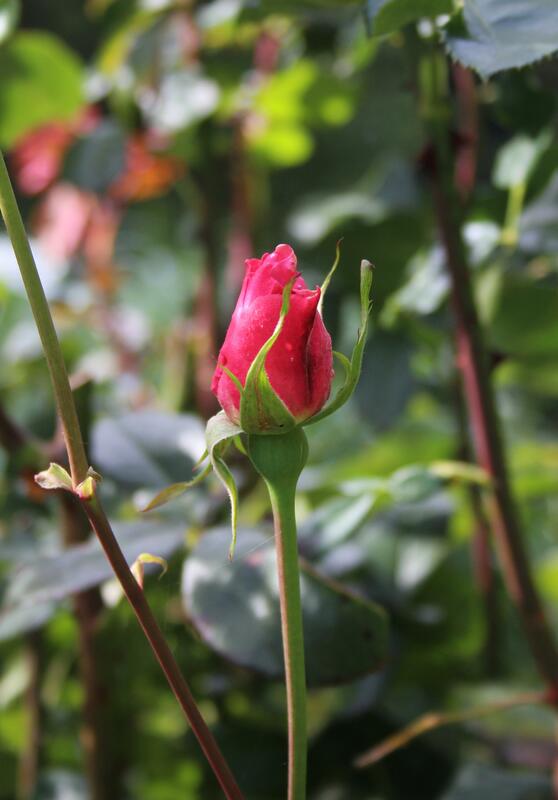 You can always remove the rose next year if it doesn’t perform well; you’ll become wise to its tricks – one bud (albeit very beautiful bud) does not a beautiful rose make. sounds a bit garbled, sorry trying to convert a proverb doesn’t always work so well! I know what you mean! Yes, I’ll give it another year and see what happens. The conditions were unusually favourable this year with our damp spring and summer. Misty mornings are a real sign of Autumn, love your view and your Acer, its such a gorgeous Autumnal colour. I hung onto to a Peony for 5 years that only ever had one or two blooms and then yesterday bit the bullet and dug it out, your lovely rose though looks as if it wants to stay for a while longer. That must have been a tough decision. Although I find that once I’ve decided a plant has to go I have no mercy! LOL! 😉 The caterpillars must be grateful! I was standing under a horse-chestnut tree last week and when the conkers fall you have to mind your head! Glad the rose gets to stay. Give it some fish and bonemeal, or some farmyard manure followed by a good Winter prune and I bet it will be fab next year. That’s good advice. Thanks Doris – I will see what feed I can come up with for it! I don’t know that they talk to me, but they frequently teach me lessons. One of the most frequent is the virtue of patience, allowing time to fix a plant or a problem. Very true. Patience can save a lot of work too! Funny how threatening plants can often snap them out of their laziness! Your persicaria is doing great, I can see why you like it so much. The rose has to stay Cathy – it looks beautiful! Well done for capturing your autumn garden in the very limited sunshine. Thanks Julie. I shall give the rose some attention and it may reward me next year too! The rescued rose I planted in my front garden has buds too, but like you I have still not made up my mind whether it has earned a long-term role. Your acer is looking beautiful, mine is barely starting to turn. This rose is such a large and established one (presumably planted when the house was built in the seventies!) it would probably be a crime to dig it out anyway! My acer was very early in turning red this year, but seems to have slowed down and there are still green bits with only a few leaves dropping so far. So yours might catch mine up yet!